Footloose: Independent, world-class walking along a continuous route in Italy. Arrive in Viterbo: Walled city with historic papal palace, cathedral, fine Romanesque churches and medieval quarter. Free day in Viterbo: Opportunities for city walk, exploring Viterbo (2 miles, 1 hr). Walk (or bus) to Bagnaia to visit the Villa Lante Gardens, Vignola’s Renaissance masterpiece, using the natural flow of water (closed Mondays) (5.3 miles, 2.5 hrs). NB Gardens entrance fee not included. Viterbo to Montefiascone: Gravel lanes lead across a plain, via ancient thermal pools, to a fine section of paved Roman Via Cassia, and on to panoramically situated Montefiascone (2,070ft), with its castle, and church of San Flaviano with a famously inscribed tomb of Bishop Fugger (11.6 miles, 6 hrs). 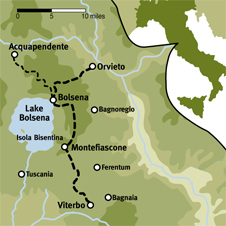 Montefiascone to Bolsena: Follow the route of the ancient Via Cassia until it disappears into woods. Then paths and farm tracks with fine views lead down along sand beaches beside the lake (swim! )…to Bolsena (1,080ft) (11.1 miles, 5.5 hours). Free day in Bolsena: Explore Bolsena, its ancient streets, castle, Etruscan temples, and ‘triple’ church of Santa Cristina, site of the miracle of Corpus Christi (1263). Opportunity for lake excursions and swimming. Optional walk from Acquapendente through the low Monti Volsinii (12.2 miles, 6 hours). Bolsena to Orvieto: Follow the old pilgrim route across a high plateau (2,000ft) with extensive views, towards Orvieto. The first view of the crag-top city is unforgettable (10.7 miles, 5.5 hrs). Free day in Orvieto: Optional city walk (approx. 2 hours), including Orvieto’s magnificent cathedral and Capella della Madonna di San Brizio, with outstanding frescoes by Fra Angelico and Signorelli, Etruscan tombs, museums and remarkable well (completed in 1537 by Antonio Sangallo) – ‘one of the second seven wonders of the world’. NB Entrance fees for attractions not included. Roman/Etruscan roads. Volcanic ash paths, farm tracks, occasional mule and forest paths and (near towns) stretches of asphalt. The fitness level of this trip is Grade 2. Very interesting cuisine combining influences of robust Tuscan cooking with strong flavours of Roman cooking and the delicate cuisine of Umbria, with truffles, fish from Lake Bolsena, etc., (we visit this area just to eat!). Some notable trattorie en route, and outstanding restaurants in Viterbo and Orvieto. Local white wines include Orvieto Classico and Est! Est!! Est!!! As a couple, married for 30 years with grown-up children, we have no hesitation of rating it as one of the best holidays we have enjoyed in all that time. The arrangements made for us during the trip itself all functioned like clock-work. The Route Manager was exceptionally friendly and efficient, and his advice on what to see and where to eat, left in amusing letters at each destination, was always worth taking. But it takes a particularly dedicated Route Manager to lend a walker his own pair of boots. We loved the villages on the route and staying 2 nights in several places was convenient and allowed more discovery. The towns were amazing. LOVED ORVIETO! We could not have undertaken, let alone enjoyed this trip without fantastic support from Saskia. She could not have been more helpful or more warm. with each itinerary. Early in the spring it can still be quite cool and fresh with bright days and dewy mornings, and it can rain. From late spring through September days are very warm, with the possibility of swimming in Lake Bolsena. In October it is cooler and fresh, with bright days. Again, there is a possibility of rain. Our Italy walking tours have a wide range of fitness levels - this trip is Grade 2 . The walking is over volcanic terrain: good walking in all weather, with many paths of deep-rose coloured volcanic ash. The basic route is only about 30 miles, but including the sight-seeing routes round ‘cities’ en route and the optional excursion, it is just over 50 miles. This allows ample time to enjoy the outstanding places en route. There are rolling volcanic hills and a flat, extensive plain around Viterbo. The lake is in a long-dead volcanic crater surrounded by lovely green cultivated hills. And, of course, the blue waters of Lake Bolsena. The paths are farm tracks, Roman and Etruscan roads, with occasional mule and forest paths, and (inevitably near towns) stretches of asphalt. 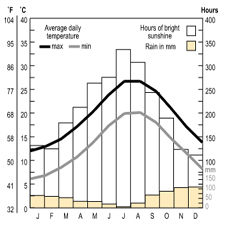 Gradients are mostly quite gentle, although each day involves a gradual climb (or descent) of about 1,000ft. 8-day: Walks are offered on on 5 days plus 2 city walks. 5-day: Walks are offered on 3 days. The walk lengths vary from 2.5 hours to a maximum of 6 hours. Hours of walking, which may vary from group to group, means hours of actual walking and does not include stops for lunch, sightseeing, rests or siestas. The recommended destination airports for this route are Rome Fiumicino and Ciampino. The routing of your journey to Viterbo depends on the day/time you are travelling and whether you plan to stop in Rome before heading to Viterbo. The fastest route to the centre of Rome is the Leonardo Express. Trains run very frequent services 7 days a week to Roma Termini station. Journey time 32mins, €14. However you are travelling directly to Viterbo from the airport, you are better off taking the metropolitan train FL1/FM1 (left-hand rail track at the airport station) which offers regular departures to Rome, with onward services to Viterbo. Total journey time 2 hours 45 – 3.5 hours, depending on routing. Cost €11. Check timetables and prices at www.trenitalia.com. NOTE: There are two stations in Viterbo: Porta Fiorentina (the principal station), from where it is a 10-minute walk to the first hotel; and Porta Romana (17-minute walk). See ‘First Hotel’ for directions. If you wish to take a taxi, you can call ahead to your Route Manager to organise or call direct on +39 0761 1876, as there is no taxi rank at the station. There are shuttle buses to Roma Termini operated by Terravision (www.terravision.eu) and SIT (www.sitbusshuttle.com) . If you buy your ticket online it will cost €9 return, slightly more if you buy on the bus or at the airport/ station. Buses leave regularly from outside the departures terminal, journey time 40 minutes. A taxi journey from Ciampino to any one location within Rome’s walls is a very reasonable (approx) €30 for up to 4 passengers. This is a flat rate set by the government. Don’t let the taxi driver propose a higher rate. The taxi rank is outside the terminal. The closest train station to Ciampino airport is “Ciampino”, which you can reach by bus (every 30 mins; cost €1, journey 5 mins) or taxi. From Ciampino station there are very frequent train services to Roma Termini, journey time is approximately 15mins and costs €1.50. Services to the other central stations take between 45 minutes-1 hour as they are not direct. IMPORTANT NOTE: Please remember to validate any train ticket you purchase in Italy before you board the train by stamping it in the green and white or yellow machine at the entrance to the platform; your ticket is not valid for travel unless you do this and you can be fined if you fail to do so. From the Porta Fiorentina station in Viterbo turn L onto Viale Trento and continue to the main road. 200 Turn R into Piazzale Gramsci and keep to the pavement along this busy road. 150 Cross the road at the pedestrian crossing, leading you to the Porta Fiorentina and pass through the arch into the Piazza della Rocca. Before the fountain turn R and walk through the Piazza (pavement on RHS), heading for the yellow block of flats at the far end. 100 At the far end of the piazza, carry on the road to the R of the block of flats - Via S. Faustino. 60 Arrive at Piazzetta S. Faustino. Turn L downhill on Via Cairoli. 50 Arrive at Tuscia on LHS. From Porta Romana station turn R and join the Viale Armando Diaz, heading straight along the main road (keeping to pavement). 400 At Porta Romana turn L through arch onto Via Giuseppe Garibaldi. 100 Take R up the Via dei Mille. Continue SO as this becomes the Via Orologio Vecchio and then Via Matel Gattesco. 400 At T junction turn R on the Via Cesare Dobici and then first L up Largo Bendetto Croce. 40 Junction of multiple roads and triangular green (Piazza Dei Caduti). Cross at pedestrian crossing over onto Via Cairoli, the street ahead of you going uphill. 100 Hotel Tuscia on RHS. We can book you a taxi from Rome Fiumicino or Rome Ciampino airport to the first hotel. The taxi holds 3-4 passengers (depending on luggage), takes approx 1-2 hrs and costs from €150. Prices may vary at weekends, Bank Holidays or late at night. Please place your booking with the ATG office at least two weeks before departure. The cost of the taxi will be confirmed to you once the booking is secured. Payment of the taxi fare should be made locally, not to ATG. The driver will have your flight details and will be waiting in Arrivals with a sign showing your name or ATG.- If you change your flight please notify us on 01865 315678 so we can contact the taxi company to reschedule the taxi for you. - If, on the day of departure, your flight is cancelled or you miss or change it, please immediately contact the ATG emergency number 01865 315600 so we can contact the taxi company to reschedule or cancel the taxi for you. - If your flight is delayed and you have arranged for the taxi to meet you at the destination airport, your taxi driver will wait for you. - If you are delayed and you have arranged for a taxi to meet you at a non airport location (e.g. a train station) it is essential that you contact your Route Manager or call the ATG emergency line to notify us at the earliest possible moment, so we can contact the taxi company to re-schedule or cancel the taxi for you. - Please note that failure to advise ATG that you cannot meet the taxi booked for you may result in the taxi costs being passed back to you. Important: Taxi prices quoted apply to the local firm used regularly by ATG – and are guaranteed only if you book through the office in advance. If you get a taxi off a taxi rank please ask the driver to confirm the price for you. The hotel Tuscia provides a garage service for €8 a night (booking required). There are also some free, unsupervised car parks in Viterbo, as well as unsupervised pay car parks. go for a creamy dish or some gnocchi. There is no need to dress up for dinner – ‘smart casual’ dress is acceptable in all but the smartest restaurants in Italy. All have WIFI and hair dryers. None offer laundry service. The recommended airports for this trip are Rome Fiumicino and Rome Ciampino. From both airports there are frequent connections to central Rome. The most frequent onward train connections are from Roma Ostiense and Rome Termini stations (hourly departures, journey time 1.5-2hrs, €5-9). A taxi from either Rome airport to the first hotel will cost ~€150. Prices may be significantly higher on Sundays and public holidays. Taxis can be booked via the ATG office. For more detailed information on reaching the route, see Frequently Asked Questions below.